How do the connections in the brain work in stress? What can people do for stress management? What are home remedies to combat stress symptoms? What's in the future for stress? Prolonged, uninterrupted, unexpected, and unmanageable stresses are the most damaging. Stress can be managed by seeking support from loved ones, regular exercise, meditation or other relaxation techniques, structured timeouts, and learning new coping strategies to create predictability in our lives. Risk factors for unmanageable stress include a lack of adequate social support. Stress is a fact of nature in which forces from the inside or outside world affect the individual, either one's emotional or physical well-being, or both. The individual responds to stress in ways that affect the individual, as well as their environment. Due to the overabundance of stress in our modern lives, we usually think of stress as a negative experience, but from a biological point of view, stress can be a neutral, negative, or positive experience. Man is the most adaptive creature on the planet because of the evolution of the human brain, especially the part called the neo-cortex. This adaptability is largely due to the changes and stressors that we have faced and mastered. Therefore, we, unlike other animals, can live in any climate or ecosystem, at various altitudes, and avoid the danger of predators. Moreover, we have learned to live in the air, under the sea, and even in space, where no living creatures have ever survived. So then, what is so bad about stress? A key to the understanding of the negative aspects of stress is the concept of milieu interieur (the internal environment of the body), which was first advanced by the French physiologist Claude Bernard. In this concept, he described the principles of dynamic equilibrium. In dynamic equilibrium, constancy, a steady state (situation) in the internal bodily environment, is essential to survival. Therefore, external changes in the environment or external forces that change the internal balance must be reacted to and compensated for if the organism is to survive. Examples of such external forces include temperature, oxygen concentration in the air, the expenditure of energy, and the presence of predators. In addition, diseases are also stressors that threaten the constancy of the milieu interieur. The neurologist Walter Cannon coined the term homeostasis to further define the dynamic equilibrium that Bernard had described. He also was the first credited with recognizing that stressors could be emotional, as well as physical. Through his experiments, he demonstrated the "fight or flight" response that man and other animals share when threatened. Further, Cannon traced these reactions to the release of powerful neurotransmitters from a part of the adrenal gland, the medulla. (Neurotransmitters are the body's chemicals that carry messages to and from the nerves.) The adrenal medulla secretes two neurotransmitters, epinephrine (also called adrenaline) and norepinephrine (noradrenaline), in the response to stress. The release of these neurotransmitters leads to the physiologic effects seen in the fight or flight response, for example, a rapid heart rate, and increased alertness. Hans Selye, another early scientist who is known for his studies of stress, extended Cannon's observations. He included the pituitary gland, a small gland at the base of the brain, as part of the body's stress response system. He described how this gland controls the secretion of hormones (for example, cortisol) that are important in the physiological response to stress. Additionally, Selye actually introduced the term stress from physics and engineering and defined it as "mutual actions of forces that take place across any section of the body, physical or psychological." In his experiments, Selye induced stress in rats in a variety of ways. He found typical and constant psychological and physical responses to the adverse situations that were imposed on the rats. In rats exposed to constant stress, he observed enlargement of the adrenal glands, gastrointestinal ulcers, and a wasting away (atrophy) of the immune (defense) system. He called these responses to stress the general adaptation (adjustment) or stress syndrome. He discovered that these processes, which were adaptive (healthy, appropriate adjustment) and normal for the organism in warding off stress, could become much like illnesses. That is, the adaptive processes, if they were excessive, could damage the body. This observation, then, was the beginning of an understanding of why stress, really overstress, can be harmful, and why the word stress has earned such a bad name. Excess stress can manifest itself in a variety of emotional, behavioral, and even physical symptoms, and the symptoms of stress vary enormously among different individuals. 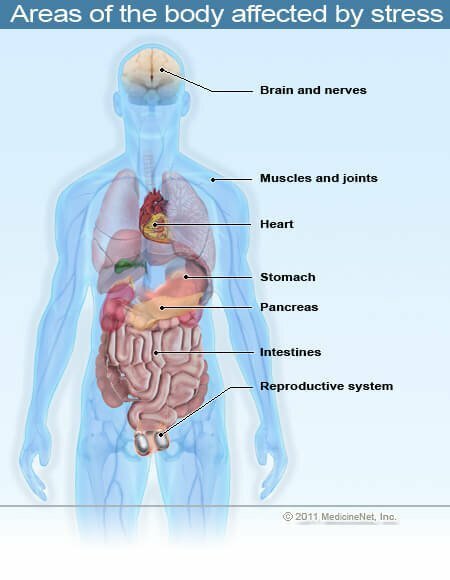 Common somatic (physical) symptoms often reported by those experiencing excess stress include sleep disturbances or changes in sleeping habits (insomnia or sleeping too much), muscle tension, muscle aches, headache, gastrointestinal problems, and fatigue. Symptoms of many preexisting medical conditions can also worsen during times of stress. Emotional and behavioral symptoms that can accompany excess stress include nervousness, anxiety, changes in eating habits including overeating or undereating (leading to weight gain or loss), loss of enthusiasm or energy, and mood changes, like irritability and depression. Of course, none of these signs or symptoms means for certain that there is an elevated stress level since all of these symptoms can be caused by other medical and/or psychological conditions. It is also known that people under stress have a greater tendency to engage in unhealthy behaviors, such as excessive use or abuse of alcohol and drugs, cigarette smoking, and making poor exercise and nutritional choices, than their less-stressed counterparts. These unhealthy behaviors can further increase the severity of symptoms related to stress, often leading to a "vicious cycle" of symptoms and unhealthy behaviors. The experience of stress is highly individualized. What constitutes overwhelming stress for one person may not be perceived as stress by another. Likewise, the symptoms and signs of poorly managed stress will be different for each person. Stress comes in many forms and affects people of all ages and all walks of life. No external standards can be applied to predict stress levels in individuals -- one need not have a traditionally stressful job to experience workplace stress, just as a parent of one child may experience more parenting stress than a parent of several children. The degree of stress in our lives is highly dependent upon individual factors such as our physical health, the quality of our interpersonal relationships, the number of commitments and responsibilities we carry, the degree of others' dependence upon us, expectations of us, the amount of support we receive from others, and the number of changes or traumatic events that have recently occurred in our lives. However, it is possible to make some generalizations. People with adequate or strong social support networks report less stress and overall improved mental health in comparison to those without adequate social support. People who are poorly nourished, who get inadequate sleep, or who are physically unwell also have a reduced capacity to handle pressures and stresses of everyday life and may report higher stress levels. Some stressors are particularly associated with certain age groups or life stages. Children, teens, the newly married, working parents, single parents, and seniors are examples of the groups who often face common stressors related to life transitions. As one example of stress related to a life transition, the teen years often bring about an increase in perceived stress as young adults learn to cope with increasing demands and pressures along with changes in their bodies. Studies have shown that excessive stress during the teen years can have a negative impact upon both physical and mental health later in life. For example, teen stress is a risk factor for the development of teen depression, a serious condition that carries an increased risk of suicide. Fortunately, effective stress-management strategies can diminish the ill effects of stress. The presence of intact, strong, supportive social support networks among friends, family, educational and religious or other group affiliations can help reduce the subjective experience of stress during the teen years. Recognition of the problem and helping teens develop stress-management skills can also be valuable preventive measures. In severe cases, a physician or other health-care professional can recommend counseling or other treatments that can reduce the long-term risks of teen stress. They influence other brain systems and functions. Prolonged or overwhelming responses of these systems can be harmful to an individual. The HPA axis is a grouping of responses to stress by the brain and the pituitary and adrenal glands. First, the hypothalamus (a central part of the brain) releases a compound called corticotrophin releasing factor (CRF), which was discovered in 1981. The CRF then travels to the pituitary gland, where it triggers the release of a hormone, adrenocorticotrophic hormone (ACTH). ACTH is released into the bloodstream and causes the cortex of the adrenal gland to release the stress hormones, particularly cortisol, which is a corticosteroid hormone. Cortisol increases the availability of the body's fuel supply (carbohydrate, fat, and glucose), which is needed to respond to stress. However, if cortisol levels remain elevated for too long, then muscle breaks down, there is a decreased inflammatory response, and suppression of the immune (defense) system occurs. Corticosteroids in measured doses are used to treat many illnesses that are characterized by inflammation or an overactive immune system, such as asthma and inflammatory bowel disease. For the same reason, they are used to help reduce the chances that our body will immunologically reject a transplanted organ. Corticosteroids also can cause fluid retention and high blood pressure. Therefore, it is critical that the response to corticosteroids be carefully controlled (modulated). This control usually is accomplished by a feedback mechanism in which increased cortisol levels feeding back to the hypothalamus and pituitary turn off production of ACTH. In addition, extremely high levels of cortisol can cause mental changes, including depression and psychosis, which disappear when the levels return to normal. The locus coeruleus has many connections to other parts of the brain, particularly areas that bring in and process sensory information (information from sight, hearing, smell, taste, and touch). The locus coeruleus secretes norepinephrine and stimulates other brain centers to do the same. It is like the pacemaker (meaning it controls the tempo) of the brain. Thus, it increases arousal (heightened awareness, alertness) and vigilance (watchfulness, carefulness) and adjusts (modulates) the action of the autonomic nervous system, which includes the SNS. The autonomic nervous system regulates blood flow, heart rate, blood pressure, and breathing (respiration). It can also temporarily shut down the gastrointestinal (GI) and sexual systems until the crisis or stressful event is over. These initial reactions, to get our blood flowing, heart pumping, and muscles energized, occur very quickly and automatically. The HPA axis and the locus coeruleus systems are linked through the hypothalamus and an area of the brain known as the limbic system. The limbic system is the control area for emotion and the processing area for memory. These linkages are critical. For example, if you see the bushes rustling, your locus coeruleus immediately gets the stress response rolling. However, when you see that it is not a mountain lion but a golden retriever in the bushes, your memory of the tameness of the dog will turn off the stress response. Similarly, if a person is nervous before a public-speaking engagement and the first minute or two goes well, this happy feeling will turn down the activity of the locus coeruleus. These internal adjustments are why experienced public speakers often start off with a joke. It's as much to calm themselves (if the joke goes well) as it is to entertain you. The connections also include the endogenous (within the body) opiate (opium-like) system and the reward (dopamine) system. Thereby, during stress, pain is reduced and an extremely happy feeling (euphoria) may result. These connections partially account for "runner's high" and have a great deal to do with why we like roller coasters and scary movies. All of this internal activity must occur in milliseconds, and it does. Animal and human research has taught us much about our internal stress systems. When laboratory animals are exposed to a prolonged stress (usually food deprivation, mild electrical stimulation of the foot, or handling), they develop a stress syndrome. This syndrome consists of high blood pressure (hypertension), loss of appetite, weight loss, muscle wasting, gastrointestinal ulcers, loss of reproductive function, suppression of the immune system, and depression. Researchers also noticed that stress of long duration (chronic stress) sensitizes the stress system (makes it more responsive to stress). That is, the system then overresponds to new stressors. They further noticed that the administration of certain drugs, such as amphetamines or cocaine, could also sensitize the stress response. Moreover, constant stress increases the self-administration of drugs in laboratory animals. So, a vicious cycle is induced. The more stress there is, the more mice seek the drugs, and the more the sensitivity (increased responsiveness) to stress is increased! Early separation from the mother has also been seen as another potent stressor in animals. Such separation has been linked to increased levels of the stress hormones that cause the stress syndrome, which includes depression. Studies in humans are under way to evaluate how maternal stress, even early in the pregnancy, can affect the developing fetus. Why might maternal stress affect the fetus? The answer is the communication of the blood circulations of the mother and the fetus. From the mother's blood, the fetus gets both the good (for example, nutrients and oxygen) and the bad. The bad components of the blood can include alcohol, nicotine, illicit drugs, some prescription medications, and stress chemicals such as cortisol and norepinephrine. These animal and human studies seem to indicate that excessive stress leads to depression. In other words, chronic stress in the mother's womb (in utero) or early deprivation (separation from the mother) might even predispose a person to developing the psychiatric syndrome of clinical depression in later life. Furthermore, other experiments show that the administration of stress hormones can actually decrease brain connections and even the number of brain cells in crucial areas, such as the limbic system. This loss of brain connections and cells then can lead to further maladaptive (inadequate adjustment) responses to stress. What's more, some particular kinds of stress seem to be even more detrimental than other types. That is, some types of stress can actually lead to diseases. For example, stresses that are unpredictable and uncontrollable seem to be the greatest culprits. On the other hand, stresses with which we can cope and master are not necessarily bad. In fact, we can learn from these stresses, predict their recurrence, and develop action plans to reduce or avoid them in the future. In this way, some stresses can actually trigger new personality growth and biologically induced adaptive (healthy adjustment) changes. Indeed, much of psychotherapy is empirically (guided by practical experience rather than theory) based upon this concept. There is now evidence that points to abnormal stress responses as causing or contributing to various diseases or conditions. These include anxiety disorders, depression, and substance abuse. Stress can affect virtually any organ system, being associated with conditions as diverse as skin rashes or hives, high blood pressure, cardiovascular disease, certain gastrointestinal diseases, some cancers, and even the process of aging itself. Stress also seems to increase the frequency and severity of migraine headaches, episodes of asthma, and fluctuations of blood sugar in people with diabetes. There also is scientific evidence showing that people experiencing psychological stress are more prone to developing colds and other infections than their less-stressed peers. Overwhelming psychological stress (also called trauma) can cause both temporary (transient) and long-lasting (chronic) symptoms of a serious psychiatric illness called posttraumatic stress disorder (PTSD). Uncontrollable, unpredictable, and constant stress has far-reaching consequences on our physical and mental health. Stress can begin in the womb and recur throughout life. One of the potential pathological (abnormal) consequences of stress is a learned helplessness that leads to the hopelessness and helplessness of clinical depression, but in addition, many illnesses, such as chronic anxiety states, high blood pressure, heart disease, and addictive disorders, to name a few, also seem to be influenced by chronic or overwhelming stress. Nature, however, has provided us with efficient processes (mechanisms) to cope with stressors through the HPA axis and the locus coeruleus/sympathetic nervous system. Furthermore, research has shown us the biological processes that explain what we all intuitively know is true -- which is, that too much stress, particularly when we cannot predict it or control its recurrence, is harmful to our health. If we think about the causes of stress, the nature of the stress response, and the negative effects of some types of stress (prolonged, unexpected, or unmanageable stress), several healthy management strategies and home remedies to combat the effects of stress become clear. An important step in stress management and treatment of stress-related symptoms is exercise. Since the stress response prepares us to fight or flee, our bodies are primed for action. Unfortunately, however, we usually handle our stresses while sitting at our desk, standing at the watercooler, or behind the wheel stuck in traffic. Exercise on a regular basis helps to turn down the production of stress hormones and associated neurochemicals. Thus, exercise can help avoid the damage to our health that prolonged stress can cause. In fact, studies have found that exercise is a potent antidepressant, anxiolytic (combats anxiety), and sleeping aid for many people. For centuries in Eastern religious traditions, the benefits of meditation and other relaxation techniques have been well known. Now, Western medicine and psychology have rediscovered that particular wisdom, translated it into simple nonspiritual methods, and scientifically verified its effectiveness. Thus, one or two 20-30 minute meditation sessions a day can have lasting beneficial effects on health. Indeed, advanced meditators can even significantly control their blood pressure and heart rate as well. Elimination of drug abuse (both illegal drugs and prescription medications have the potential for abuse) and no more than moderate alcohol use are important for the successful management of stress. We know that people, when stressed, seek these outlets, but we also know that many of these substances sensitize (make even more responsive) the stress response. As a result, small problems produce big surges of stress chemicals. What's more, these attempts with drugs and alcohol to mask stress often prevent the person from facing the problem directly. Consequently, they are not able to develop effective ways to cope with or eliminate the stress. In fact, even prescription drugs for treatment of anxiety, such as diazepam (Valium), lorazepam (Ativan), clonazepam (Klonopin), or alprazolam (Xanax), can be counterproductive in the same way. Therefore, these medications should only be used cautiously under the strict guidance of a physician. If, however, stress produces a full-blown psychiatric problem, like posttraumatic stress disorder (PTSD), clinical depression, or anxiety disorders, then psychotropic medications, particularly the selective serotonin reuptake inhibitors (SSRIs), are extremely useful. Examples of SSRIs include sertraline (Zoloft), paroxetine (Paxil), fluoxetine (Prozac), citalopram (Celexa), and escitalopram (Lexapro). We know that chronic or uninterrupted stress is very harmful. It is important, therefore, to take breaks and decompress. Take a lunch break and don't talk about work. Take a walk instead of a coffee break. Use weekends to relax, and don't schedule so many events that Monday morning will seem like a relief. Learn to recognize and respond to your stress signals. Take regular vacations or even long weekends or mental-health days at regular intervals. Create predictability in one's work and home life as much as possible. Structure and routine in one's life can't prevent the unexpected from happening. However, they can provide a comfortable framework from which to respond to the unexpected. Think ahead and try to anticipate the varieties of possibilities, good and bad, that may become realities at work or home. Generate scenarios and response plans. One might find that the "unexpected" really doesn't always come out of the blue. With this kind of preparation, it's possible to turn stress into a positive force to work for growth and change. For those who may need help dealing with stress, stress-management counseling in the form of individual or group therapy is offered by various mental-health-care providers. Stress counseling and group discussion therapy have proven to reduce stress symptoms and improve overall health and attitude. Stress is part of life and will always be around. The keys to dealing with stress are appropriate control of stressors and management of our physical (physiological) and mental (psychological) responses. In this regard, critical incident stress debriefing (CISD) involves discussing the traumatic event as soon as possible after the event. Although it is thought to help lessen extreme (pathological) reactions to stress and often prevent PTSD in its worst forms for some individuals, other research has called its effectiveness into question. Hopefully, the circumstances in which CISD can be useful can be clearly delineated and this approach to stress management can be translated into helpful strategies for managing the more common (normal) types of stress. We all have slightly different stress responses because of our genetic makeup. In the future, perhaps we will be able to alter our genes (for example, if we are genetically determined to be over- or underreactors to stress). In fact, the field of pharmacogenetics (medicines that enter the cells' DNA and turn on or off certain genes) is very promising for the area of stress and health. Chiesa, A., and A. Serretti. "Mindfulness-based stress reduction for stress management in healthy people: a review and meta-analysis." Journal of Alternative Complementary Medicine 15.5 May 2009: 593-600. Chrousos, George P. "Stress and Disorders of the Stress System." Medscape.com. <https://www.medscape.com/viewarticle/704866>. Gore, T. Allen. "Posttraumatic Stress Disorder." Medscape. Mar. 7, 2018. <http://emedicine.medscape.com/article/288154-overview>. Lowry, Fran. "Stress, Depression Linked to Accelerated Aging." Medscape.com. Mar. 1, 2012. <https://www.medscape.com/viewarticle/759510>. "Stress." American Psychological Association. <http://www.apa.org/topics/stress/index.aspx>. United States. National Institute of Mental Health. "Posttraumatic Stress Disorder." Feb. 2016. <http://www.nimh.nih.gov/health/topics/post-traumatic-stress-disorder-ptsd/index.shtml>. Canker sores are a common complaint, and are small ulcers on the inside of the mouth. Canker sores aren't contagious (as opposed to cold sores), and typically last for 10-14 days usually healing without scarring. A variety of things cause canker sores, for example, medications (aspirin, beta-blockers, NSAIDs, high blood pressure medication, and antibiotics); injury to the mouth from dental work, braces, or sports accidents; acidic foods; allergies; and diseases or conditions like celiac disease, Crohn's disease, and lupus. Canker sores can be cure with home remedies, and prescription and OTC topical and oral medication.